A lander set to be deployed of Maria Island, aboard the research vessel Southern Surveyor. The lander will be on the sea floor at the bottom of a 90m mooring line which will have deep-sea recorders attached at specific depths. 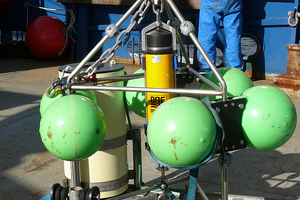 The recorders are being deployed as part of the Australian National Mooring Network, collecting various oceanographic data over time, as part of Australia's Integrated Marine Observing System (IMOS). This is a five-year, $92 million collaborative program, designed by the marine science community, to collect and provide data for research into emerging critical marine issues, including the effects of climate change and the sustainability of our ecosystems. Photographer : James Porteous on April 10 2008.